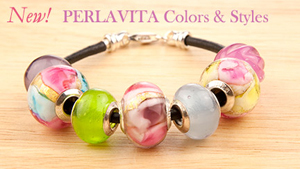 Shop here for our latest releases for our PERLAVITA line of interchangeable jewelry, including new Murano glass charm beads, dangles, and jewelry. Create your own colors. Just select your bracelet and the beads you want. They are interchangeable, so you can match your outfit every day with our huge variety.